Encouraged by the overwhelming response received all these years, ANGLER Technologies, a pioneering Offshore Software Development Company specialized in offering outsourced product development and IT outsourcing services is happy to announce its participation for the 9th consecutive time as exhibitors at the 34th edition of GITEX Technology Week 2014 in Dubai, slated to run from 12th to 16th October 2014 at Dubai International Convention and Exhibition Centre, United Arab Emirates (UAE). We are continuously participating in GITEX one of the largest ICT exhibitions in the world, to meet our long-term clients & to showcase our latest services and product offerings to customers & prospects in the Middle East & GCC region. 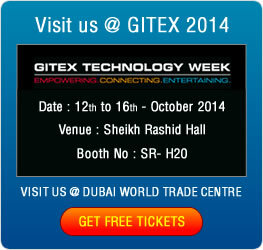 In GITEX 2014, will be showcasing our products and services at Stand No. SR – H20 in Sheikh Rashid Hall. We will have our management and our Dubai office personnel at the stall to interact with customers and address their queries with apt solution. Our wide range of innovative, tailored product and software solution offerings include Time & Attendance Solutions, E-Commerce storefront Solutions, Quality Management Software, Survey Builder & Poll Management Software, Event Management Software, E-Learning & Assessment Solutions, Corporate Instant Messenger, Visitor Management Software, Content Management System (CMS) Solutions, Recruitment & training , QR Code Builder and Custom ERP Solutions. Offshore Staffing & Managed Services with a blend of technology skills including Open Source Technologies like PHP / MySQL, RoR, WordPress, Joomla, Magento, Drupal, etc. Microsoft Applications like Net, Infragistics, Sharepoint, SQL Server, etc, Mobile Application Development skills like iPhone / iPad, Android, Blackberry, Windows Phone, Social Media Applications and much more that paves way to keep pace with the challenges ahead. We also look forward to the event as an opportunity to meet with and consolidate our relationships with our existing vendors, discuss strategic initiatives and plans with our channel partners, reaching new potential customers, tying up with new vendors to grab big business deals or contacts. Register with us online and get free tickets to meet us and see how ANGLER could be of value addition and would add a lot of momentum to your business.